You have once again entered the world of survival horror. 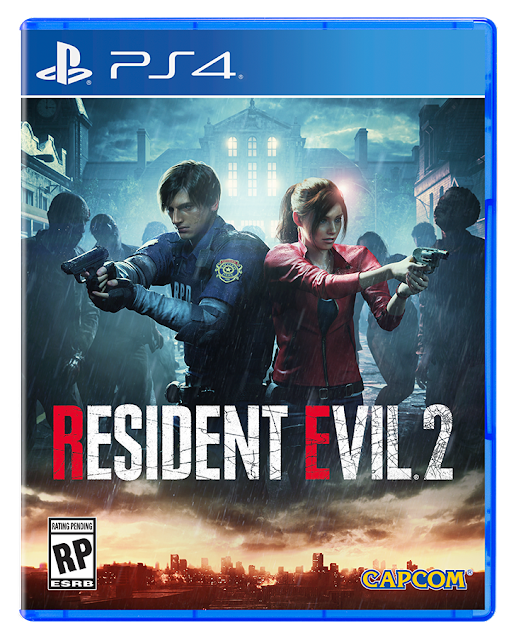 Great news for fans of Resident Evil 2 across North America – fresh from the Resident Evil panel at this year’s San Diego Comic Con, we just unveiled the Resident Evil 2 Collector’s Edition, available exclusively at GameStop and EB Games for $199.99 (239.99 CAD)! Read on for additional details of what you’ll find contained within this package designed to replicate the item boxes you find in the game. First off is the package itself, designed as a reproduction of the familiar item boxes that have shown up in various Resident Evil games over the years! Just like it protects your items in-game, it also protects the contents until you’re ready to put them to good use. So, what’s in the box? A 32-page book left behind by Ben Bertolucci, a freelance journalist who makes an appearance in Resident Evil 2. This file contains photos and files documenting events after the Raccoon City tragedy, and was filed away as a highly confidential document by the U.S. government. It's never been seen by the public… until now. Just revealed at the Resident Evil panel at San Diego Comic-Con, we have a bunch of new information on Resident Evil 2 straight from the game’s producer, Yoshiaki Hirabayashi! Remaking a true classic is no easy feat, but the talented team at Capcom behind the upcoming Resident Evil 2 is certainly up to the challenge. Originally revealed with the “WE DO IT” video that’s become well-known among fans, Hirabayashi explained how this new version of Resident Evil 2 exists because of overwhelming fan demand. This is not just a remake – it’s a complete redesign of Resident Evil 2, including the iconic Raccoon City Police Department and the surrounding Raccoon City. Speaking of, one of the topics covered was Leon’s younger look in Resident Evil 2. Compared to later entries, the goal was to give him more of a fresh-faced rookie look in contrast to the hero that he becomes later on in the series. Famous for having one of the worst first days on the job in history (they cancelled his welcoming party and everything), a lot of thought was put into how Leon’s new, yet classic, look would work with modern photorealistic graphics. As a result, the team created a physical version of Leon’s costume, using photogrammetry technology to scan his clothes into the game and added minor details and changes afterwards. 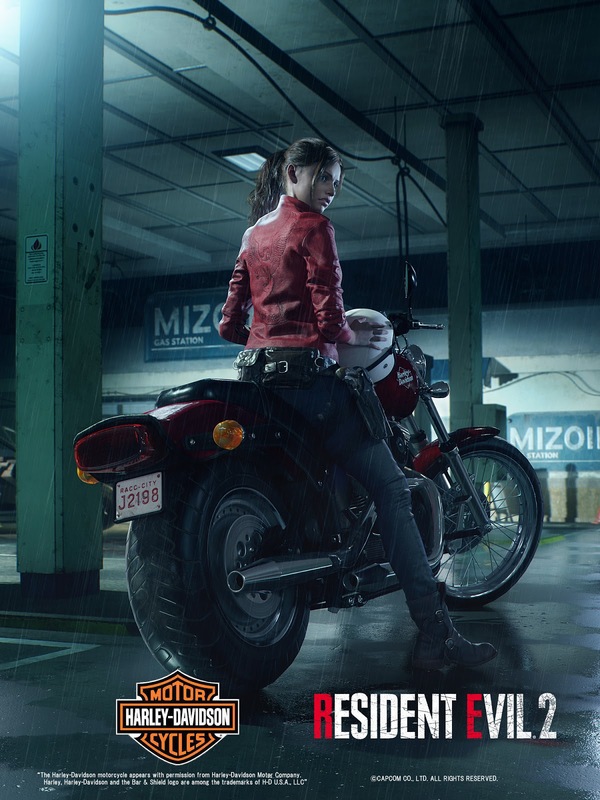 Resident Evil 2 isn’t complete without Claire, our hero who comes to Raccoon City searching for her brother Chris. Claire’s updated design uses the same technology, scanning in a real-world costume to capture every last detail of her outfit. The team had quite a bit of discussion on how to design her new look, and how much of it should retain her appearance from the original PlayStation Resident Evil 2. Ultimately, the team decided on an appearance that would line up with the iconic scene of Claire entering Raccoon City on her motorcycle. The team is extremely happy with her final design, and hope you all enjoy it as well! For the city itself, the team put a major focus on two concepts that permeate throughout the game: A sense of wetness, and playing off a fear of the dark. Using the powerful RE Engine, the team has been able to achieve their goal of creating a sense of dread through these visual cues. The events ofˆResident Evil 2 take place on a rainy day in Raccoon City, causing puddles and flooding in parts of the city, while others areas are covered in the grotesque aftermath of clashes with the undead and other terrors lurking in the gloom. Finally, it’s not Resident Evil 2 without zombies! Hirabayashi and the team discussed how they designed the scourge of undead in the remake. Simply put, they wanted to create something monstrous that you didn’t want to be bitten by! To that end, zombies have been created with the same concepts of wetness and darkness in mind, ensuring that every encounter is just as tense as the one before. 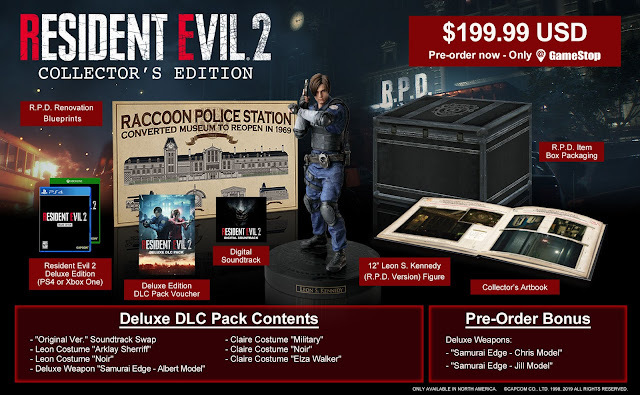 Also revealed at the panel, we’ve got fresh details on a special Resident Evil 2 Collector’s Edition for North America, available at GameStop and EB Games! Packed up in a box that looks just like the iconic item boxes from Resident Evil 2, this edition boasts a 12″ figure of Leon, art book, costumes, and much more. Available exclusively at GameStop and EB Games in North America for $199.99 ($239.99 CAD), check with your local store or visit GameStop.com to secure your pre-order! Raccoon City is ready to welcome you with open arms when Resident Evil 2 comes to PS4 on January 25, 2019.